Though famous for copying pre-war German optical designs, the Soviet designers seem to have come up with a new formula for their Leica Screw Mount Russar MR-2 20/5.6 wide angle. 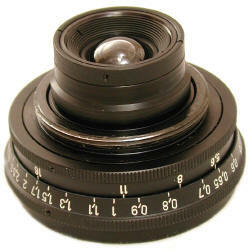 Introduced in 1960, for decades it was the only 20mm lens in screw mount. Hard to get, Russars enjoy a fine reputation as a sharp lens. Russars offer a bargain priced real alternative to what may be a seldom used $2000 20/2.8 Elmarit for your Leica M.
Made in Leica Screw Mount, Russars will fit the M's using Leica's ubiquitous M adapters. They ARE NOT rangefinder coupled, but then they don't really need it with their depth of field. The lens weighs in at only 2 1/2 oz, the finder at 3 oz. Filter size is 48mm, though some filters may give vignetting. Close focus is just under 1/2 meter. The aperture runs from 5.6 to 22. The f/stop scale is next to the glass, inside the filter ring. You will be scale focusing. With deeply recessed glass, no lens shade is provided or usually needed. Russars come in several varieties. Introduced about 1960 in chrome, they were made in black finish from about 1992. 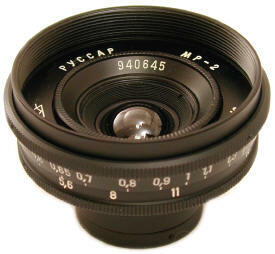 In Russian lenses, the first two digits of the serial number indicate the year of manufacture. Too bad more manufacturers don't follow that idea. I've had excellent results with a black Russar. Several Russar viewfinders have surfaced. The latest is all black and square in shape, as shown above. No brightlines, but it does have parallax correction on the shoe, unlike the Leica's 21 finder. It's an excellent finder. I sold my Leitz 21 finder and kept this one. If you use the 20mm a lot, probably the $2,000 Leica Elmarit M is a good idea. 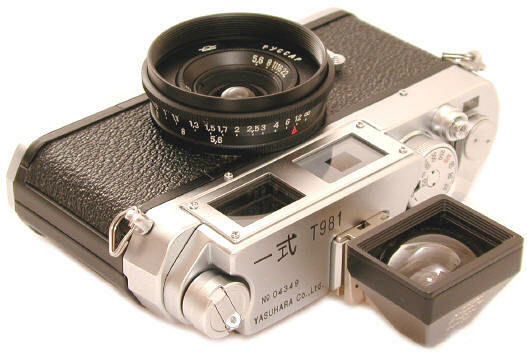 But if its occasional use, this little gem can save you a lot of money for film and developer. Rear Caps can be a bit of a problem. The original rear cap is a deep seated screw mount. If you lose it, you will have a tough time finding a replacement. If you use the lens on an M, you need a very deep M cap for convenience. The deepest M caps are for the 21's, and even used they are still quite expensive. The solution, a brilliant one I might modestly add, is to combine two inexpensive caps. Take a double ended bayonet cap (designed to store two M lenses back to back in a camera bag) and a 42mm Leica plastic cap designed to sit on top of a reversed M hood. The 42mm caps fits inside the end of the M cap perfectly, just like it was made to do so. Use silicon to combine them, since then you can always take them apart if you want to. Presto! With ten dollars in caps, you have made an expensive deep rear cap for your Russar with M bayonet adapter mounted. This idea is registered with NATO and the SPCA, who rigidly enforces my $20 per cap licensing fee. Send cash. The Russar will NOT fit the Leica/Minolta CL or Leica M5. The rear element prevents the lens from mounting. Taken by Bernard Delgado of NY Times with Russar 20/5.6, copyright Bernard Delgado. Image and photographer's ability always outshines lens price and lens tests. 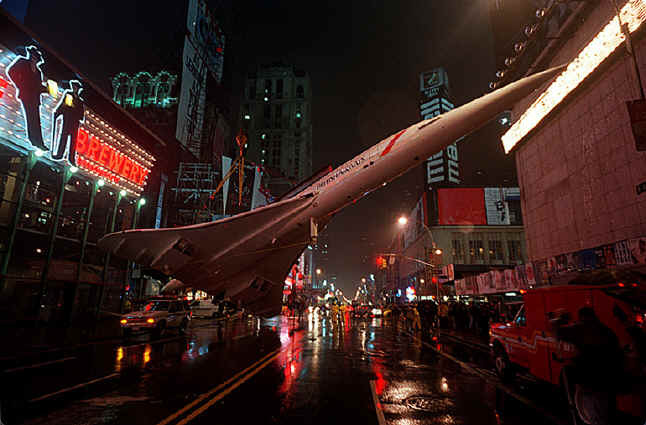 "It was rainy in Nov, late in the evening. I handheld the shot at about a half sec at f/5.6 on 400 ISO film. A great lens to handhold, which really makes up for the slow aperture. The slight softness is more from the model plane being swung into position by a crane. I can't even remember IF I had yet obtained the accessory viewfinder."